Before the start of the 2005 season, there had been less than a half dozen events in the history of the Busch North Series that Kelly Moore had not entered. This season, he went back to a limited schedule with the emphasis of the family team being on helping his son Ryan go fast. Now after sitting out the first three races of the year, Kelly is back behind the wheel at New Hampshire. The humid weather on Thursday didn’t help to avoid that from happening. The decision to concentrate on Ryan’s #74 entry has paid off so far this year. Ryan won his first Busch North event last week at Lake Erie Speedway and topped the Busch North practice sheets at NHIS. Kelly was a very proud father last weekend standing in victory lane in street clothes for the first time in the series. Nevin George is doing double duty at New Hampshire this weekend, with entries in both the Busch North and Modified races. The Modified portion of the weekend started out with a bang when something very odd led to a hard crash. George was unhurt. His #0 wasn’t. With qualifying rained out and the field set by points, Gallo will have to start on the back row in 35th. That will make a good finish more challenging, but not impossible. Two NASCAR Touring regulars will get opportunities in the NASCAR Nextel Cup Series this weekend. After running both Cup races at NHIS last year, Ted Christopher will be back in Kirk Shelmerdine’s car. Joey McCarthy will join him as well in attempting to qualify for the race. McCarthy will drive the #34 Mach One car that has been previously wheeled this year by Randy LaJoie and Jeff Fuller. 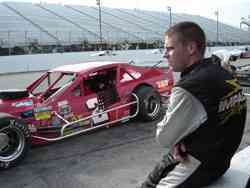 Two NASCAR Whelen Southern Modified Tour drivers, Brian Loftin and Alex Hoag, made the tow to NHIS. The track is not unfamiliar ground to Loftin, who drove the #79 car in last September’s event at the Magic Mile. Also wrecking on Thursday, but not getting back on the track was Tracy Gordon. The Maine driver wrecked his #33 Busch North car in practice and had to load it up and go home when the damage was too severe to fix at the track. Former Lee USA Speedway (NH) regular Mike Gallo doesn’t get out to many races during the year. The Maine driver has shown that he is more than capable of running up front, but limited resources means that he has to pick his races wisely. He goes to NHIS twice a year and always runs strong enough to contend for poles and race wins there. Taking a road trip was an easy decision for Loftin and his team to make. Brian Loftin looks over his #2 ride. His normal #23 is used on the Modified Tour by Gregg Shivers. 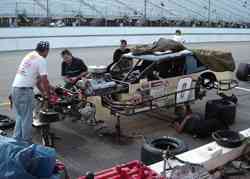 The team did not have a back-up car at the track, so they were forced to repair their primary car. Rookie Modified driver Tyler Haydt has never run at NHIS and running there for the first time is quite a different experience for the young short tracker.